Scooter Braun has never stopped being a Belieber. 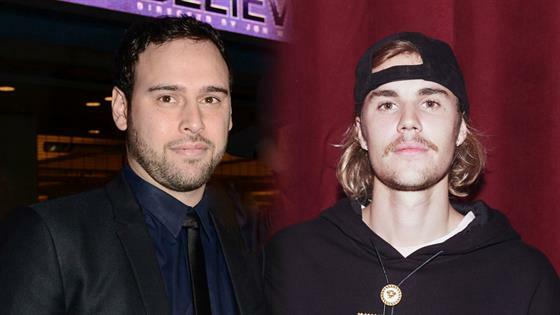 Braun, who manages Justin Bieber and Ariana Grande among many others, spoke on Van Lathan's The Red Pill Podcast about his recurring nightmare that Bieber's life would be cut all too short. The manager told Lathan, "There was a time when I would go to sleep almost every night—when he had the money to fly away from me—and I was worried every night that I was going to lose him." He elaborated: "I thought he was going to die. I thought he was going to sleep one night and that he would have so much crap in his system that he would not wake up the next morning." The period of time Braun is discussing mostly refers to 2014 when Bieber had a string of negative incidents, including getting arrested for a DUI while drag racing a Lamborghini in Miami. The "Sorry" singer was just 19 at the time. Just days before the DUI, Bieber's home was raided by police after they had reason to believe he was involved in an egg-throwing event that caused $20,000 in damage to his neighbor's house. Around the time of his DUI, a source told E! News that the singer's close network had been "encouraging him to go to rehab for a while. He won't listen to his team." Bieber's own demons stuck with this manager as well. Braun told the Wall Street Journal in 2017, "I failed him day after day." He continued, "We were living in hell because he was in such a dark place." During this time period in Bieber's life, Braun insisted that the "What Do You Mean?" singer take a hiatus from touring and making music. There was one glaring reason why: Bieber's health and substance abuse. Braun explained to Lathan, "He used to yell and scream at me, and he wanted to put music out, he wanted to tour, but I thought if he did that, he would die. So, I just refused." While these few years were a rough patch for Bieber, Braun told the Journal that he would be loyal to the singer, no matter what. "I made a promise to him when he was 13 that I would never give up on him. I plan on keeping that promise," he said. Bieber's choice to get clean was ultimately up to the star himself. Braun said on the podcast, "I think he made a conscious choice for himself to change, I think for a year and a half I failed miserably trying to help him, because for year and a half he didn't change...It wasn't until one day he woke up and said, 'Hey I need to talk to you, I don't want to be that person anymore.'" Braun emphasized that who Bieber is today—an engaged man to Hailey Bieber and still churning out top hits—was "a result of [Bieber's] own decisions, no one else's." He called the musician an "extraordinary young man who's been given an extraordinary life." Brain continued, "And he used to complain, and he used to fight it and that's when he got into a dark place, but when he accepted his responsibility and took a hard look at himself and not what everyone was doing, that's when he owned it and he got healthy." Even Bieber knows how far he's come since his days of drag racing and rambunctious behavior. In April 2017, he posted a photo on Instagram showing a side-by-side comparison of 2014 Bieber (his mugshot) versus 2017 Bieber (a selfie). "I LOVE THIS because it reminds me IM NOT EXACTLY WHERE I WANT TO BE BUT THANK GOD IM NOT WHERE I USED TO BE!! THE BEST IS YET TO COME DO YOU BELIEVE IT?" he captioned it.